In Win Scan To PDF you have the preview, rotate, the page, or adjust the image to PDF, all useful features when creating PDFs! ► ... Rotate the image or scan before PDF creation! ► ... Image / Scan: Fit to the Page or Crop to the PDF Page! ► ... Preview the PDF output file! (Image-1) Preview, rotate, customize the page to PDF! In the new preview of the PDF pages (super function!) In version 3.78 (Unicode) seems to be a mistake. If you click on the entries for several images in the list on the left in the window, the wrong thumbnails are usually displayed in the preview field on the right. Sometimes the first scanned image is displayed in the list when the last scan is selected, and when the middle scan is clicked, the last scanned image is displayed. Then the assignment of the list entries to the actually displayed thumbnails again seems to change arbitrarily. By clicking on "show picture" but the correct image in the default viewer opens, so not the image that is currently displayed incorrectly in the preview, but the image marked in the list. And even after clicking on "to PDF" the order of the pages in the created PDF file is correct. Only the preview in WinScan2PDF does not show the image selected in the list, but any other one from the list. 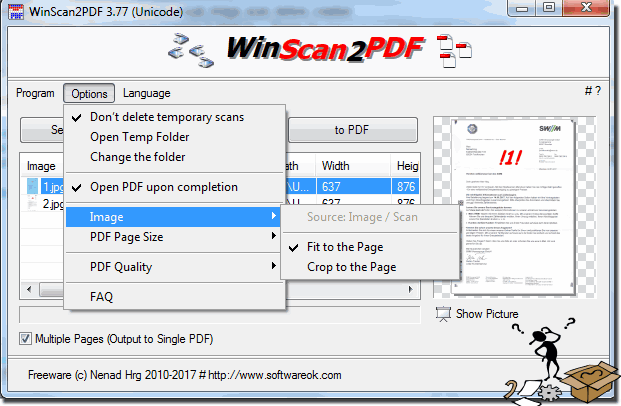 WinScan2PDF - FAQ-12: Preview, rotate, customize the page to PDF! In the new preview of the PDF pages (super function!) In version 3.78 (Unicode) seems to be a mistake. ?